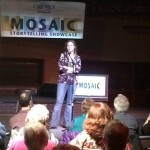 Once upon a time, I drove to the inaugural Mosaic Storytelling Showcase in the rain, muttering my story under my breath. Over and over, I worked the transitions and cataloged the scenes. A week earlier, during tech rehearsal, there were only 16 advance tickets sold. I knew, from buying tickets the day before, the number was closer to 100. Still, the rain was bad and it was a Tuesday night. I expected 30-40 people to show. When I entered the Warehouse, it was mostly storytellers and staff. We milled around, joking about nerves. Soon, there was no milling. The place was filling up. Fast. It was far more than 100 people. It was closer to 200. Soon, there were no more tickets, no more parking, no more seats. The other tellers and I knotted near the side of the stage, mumbling versions of the same sentiment. I kept telling myself this was good. It was good for the Haven of Rest and S.A.F.E. Place, the organizations receiving the ticket sales. It was good for the future Mosaic storytellers, who would perform later this year. It was good for our community. I just didn’t feel so good. I tried to roll through my story scenes again, but my mind was blank. Someone announced the restaurant next door was towing cars. People scrambled for keys. I gave an elderly woman a stool I found near the stage. Someone else found an old office chair for her companion. Leaners lined the bar and every wall. During rehearsal, we had adopted a baseball approach to placement. The teller ‘at-bat’ was onstage. The teller ‘on-deck’ was sitting upstage. The teller ‘in-the-hole’ was at the foot of the ramp, offstage. If it wasn’t your turn, you could sit wherever you liked. That night, most of us stood together, leaning against the ramp’s metal rail, listening. That rail was our dugout. I didn’t know most of my fellow tellers prior to this event. Over the last month, I watched their stories evolve to the point where I could anticipate my favorite parts. I admired their bravery and honesty. I valued their advice and encouragement. I enjoyed their company. These were good people, and it was an honor to share the railing and the stage with them. I don’t remember much about telling my story, except folks seem to laugh in the right places. After I finished, my hands shook. When Joyce Wilson returned after her story, she stood next to me. I told her about the shaking, raising my still-trembling hands. She smiled, and took my hands in her own. We leaned against the rail – listening and trembling together. Battle Creek Enquirer Executive Editor Mac McCullough had a vision about bringing the community together over stories. He wanted our showcase to reflect the textured experiences of its residents, starting with stories about “home”. I think we did that. Although from different races, religions, backgrounds and ages, we all call Battle Creek home. And, standing there with my team in front of our community, I felt a kinship with everyone in that room. Home is where the heart is, and this city has my heart. What to listen to the other storytellers? Check out the individual videos at the Enquirer’s website.